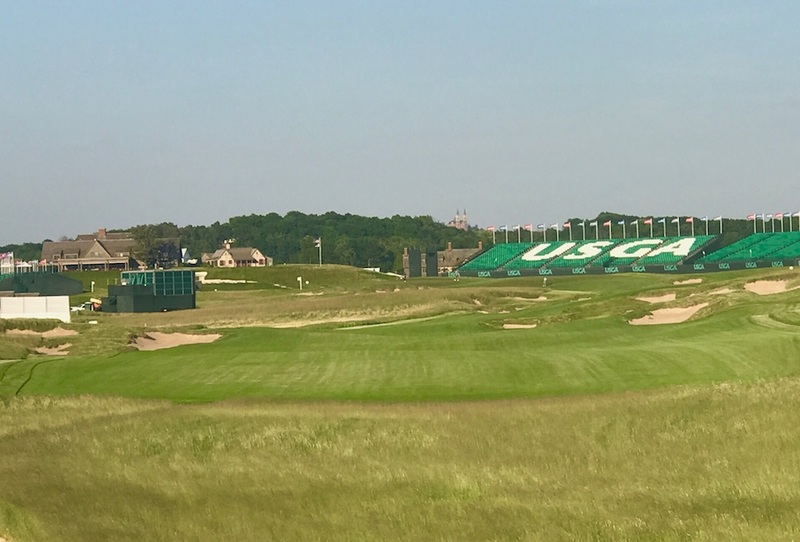 Brad Klein of Golfweek.com fills in some details on Friday's U.S. Open setup that are eye-opening for those interested in the art and science of course preparation. Green speeds started out at 12.5 to 13 on the Stimpmeter and lost 6-7 inches of speed during the day. Friday, they’re half-a-foot faster, roughly 12.8-13.5 before they lose some speed. PGA Tour specifications virtually mandate that the hole not be cut on a slope of more than 1.5 degrees. Sorry for the technical stuff here, but it’s all a matter of physics and topography. The USGA doesn’t shy away from setting the hole on slopes of 2-3 percent. That might explain the number of balls that took some pretty strong turns right around the hole during round one. And, in the ball-doesn't-travel-too-far files, this about the par-5 18th. Friday, it’s been stretched to 675 yards, which means players, even downwind, probably won’t be able to fly it over the fairway bunkers on the right as they did Thursday and reach the downhill kick point on the hole, achieving an average of 318 yards off the tee. On a positive note, the conservative setup approach light on risk-reward has allowed pace of play to actually be better than in recent years (5:16 average in round one). The slower green speeds surely have something to do with that, too. Yes it's strange and maybe a little embarrassing that the USGA didn't notice pre-tournament that this really lush native grass just outside the roughs was total overkill, and even more bizarre that they had to have crews descend upon the crime scenes so aggressively. But Bradley Klein, who was out early with the crew Wednesday as they cut down more roughs on the 18th hole, writes for Golfweek.com that this all started a week ago, so perhaps we can chalk all of this up to just seeing how the course plays and adjusting accordingly. Actually, the cutbacks of fescue started more than a week ago, before the players arrived en masse, before the bellyaching from some golfers. The USGA and the Erin Hills maintenance crew have been pulling back some of the denser, taller fescue to uncover bunkers that had gotten overgrown, opening up more lines of visibility. On the 338-yard, par-4 second, crews removed the tallest fescue from the back of a massive fairway carry bunker. The move created more options for players to try the 280-yard carry and benefit from the downhill slope behind – without the risk of losing a ball that made it over. Rex Hoggard writes at GolfChannel.com that much of the fuss involves deep-seeded tensions between players and USGA. The USGA has become the game’s most polarizing organization. Some questioned Tuesday’s nip/tuck as more than simply a “prescribed plan based on weather,” as the association’s spokesman explained. They contend the “trimming” was an attempt to quiet the crowd at an event that desperately needs to avoid another major miscue. Whether that’s the case really didn’t matter. Not on Tuesday as news of the cutting was met with a mixture of eye rolls and raised eyebrows. It’s not that players didn’t believe the official statement, but they’ve become conditioned to think the worse when it comes to the USGA. In buried lede news, Brentley Romine notes at Golfweek.com, the bunkers may be the real danger at Erin Hills. I've already seen some bizarro stances, lies and situations in very basic practice round situations. When the gates open, expect more madness. And speaking of that, I've written a guide for the sadists, lookie loos and others who want to know what holes to watch for the crueler antics. If things are at all firm, we'll be talking about these greens on Sunday night instead of fescues. Certainly a lighter way of highlighting the dense natives just off the fairways. I can't fault Kevin Na entirely for his rant about the Erin Hills natives. The fescue grasses are beautifully managed throughout a property that is pretty stunningly maintained. The grasses are sparse where they'd naturally be thin and more dense where water collects. So to see the native grasses clearly receiving fairway irrigation overspray is not generally a shocker. We see it all too often on prairie courses. But the decision not to manage (trim) these crucial areas just off the primary cut is a risky one given how severe they are (to the point of the natives leaning over). A herd of goats or some refined thinning practices could have alienated what will be a potential lost ball issue. That said, Na's suggestion that players should be handling setup is a frightening one! And a video that may require hitting the link as Twitter video embeds are acting strange. The weather was feisty but the quality of the leaderboard made it a bit eye-opening that only nine players hit Muirfield Village's 16 green Sunday. Gary McCord hit the point as deftly as he could with the architect of the revamped hole hosting the event. TTo have only nine players in the final round of the Memorial keep their tee shots on the putting surface was one thing, but to have so many miss so consistently will be of even greater concern when the tour staff reviews the ShotLink numbers. The 2017 leaderboard was stacked with some pretty big names, and while we'd love to chalk this freaskishly low number to just the wind, the architecture deserves more scrutiny. A combination of the hole's odd angle, yardage and green complex remains problematic, at best. And new green firmness can no longer be blamed. Here are the greens in regulation numbers from Thursday to Sunday: 44, 40, 47 and 9. One birdie Sunday. The NCAA's plan to play men's and women's Division I finals at the same course is undoubtedly making their venue option list very short. And as Andy Johnson notes at FriedEgg.co, you can't fault them for going to a place like Rich Harvest Farms, which has generously opened its doors to Solheim Cups, Western Amateurs and more. But the course that was once ridiculously ranked by Golf Digest's panel only to suffer a fall, still has many wondering why Jerry Rich's design is even viewed as top 100 worthy. Things aren't off to the best start at Rich Harvest Farms, with a weather delay leading to a shortened event and an artificial surface tee box getting put into play. Saturday's nasty weather wasn't Rich's fault, especially since superintendent Jeff VerCautren did all he could to have the course ready to take on an inch of rain (as it did for Saturday's women's D1 round two). Play was still cancelled despite beautiful afternoon conditions. Lance Ringler at Golfweek.com explains what went into the thinking behind cancelling the round and shortening the women's stroke play portion of the proceedings. More disconcerting though was the Janet Lindsay's decision, forced by wind forecasts, to use an artificial surface tee that was difficult for players to actually penetrate with tees. Brentley Romine reports for Golfweek.com. “I thought to myself, some kids probably have never hit off a mat in their whole life,” said Ohio State head coach Therese Hession. The mat made it difficult for players to put their own tees at proper heights. Some players used mini tees provided by officials, but even those weren’t suitable for everyone. One player grew tired of attempting, threw her tee on the ground and hit hybrid off the deck. Most every player hit some sort of hybrid on the hole on Friday. The Masters press conferences always seem to make players up their game in architectural and course setup assessments. Three favorites from today's 2017 pre-tournament pressers, starting with Adam Scott on how he gets reacquainted with the course. ADAM SCOTT: Yeah, the couple things that really come to mind as I think about that quickly is the severity of the slope on the fairway and standing on uneven lies. Sunday here, my second shot into 2, I had a perfect tee shot and I had a 3‑iron into the green, and as I walked into the bowl, I was shocked at how severe the downslope was and had to back off and completely readjust to how I was going to hit the shot. It's very severe, even though it doesn't look it, because there's so much slope everywhere else, I think you can sometimes be fooled. That's one of the big things. The other thing for me is when I look at my aim points off tees, I think of 10 especially, there's been a branch up in the top of a tree that I look at every year to get that line. That's an important tee shot to kind of have to move one, and so I just check that that same branch is there and if it's not, I don't know what I'll do. But it was there again this year, a little U‑shape up in the top of the trees there through the fairway. Those kind of eye lines and comfort things that have obviously been in the last five or six years really comfortable for me here, I check those. I've felt very comfortable getting back on the greens this year, probably more so than ever. I feel like now I'm really getting a good understanding of the fall lines and the few little nuances they have here, because obviously they are very tricky at times. So I feel very comfortable with that. And they are the kind of things ‑‑ but my level of comfort here the last five years has grown so much, and now it's far less daunting coming here than in the past. Q. And 13th tee shot? ADAM SCOTT: It's really condition‑dependent. If there's a little help, I like to hit the driver and aim it at the kind of corner of the trees through the fairway, and if it draws, then it's perfect. And if it doesn't, it's 50/50 it might get a bounce to the left in the grass and it might go in the pine straw. But I think if there's a bit of help, I can hit it long enough. I know I can carry the corner of the trees, not the highest point like Dustin Johnson hits it over, but I can get across the corner and it's worth trying to get a 7‑ or an 8‑iron in on a helping wind. And if it's not helping, I'm very comfortable just hitting a 3‑wood pretty straight. It's now 200‑maybe‑yard run‑out up there, if you just hit a nice 3‑wood, it shouldn't run out. So it's not a real priority for me to turn it around the corner. Phil Mickelson on the delicate art of lengthening and how a golf course should properly ebb-and-flow. Q. You've designed some great golf courses like Whisper Rock, and now that the Club has room to move the tee back on No. 5, No. 2 and possibly No. 13 one day, would you be in favor of that? PHIL MICKELSON: Well, longer is longer. Longer isn't always better. Sometimes it is; sometimes it isn't. I think that you want to make the hard holes harder, but you don't want to make the ‑‑ you want to actually make the easier holes easier. So when you start looking at the birdie holes, which are the par 5s, the last thing you really want to do is continue to lengthen them to where they are not reachable and they become just a wedge game for everybody. Loses a lot of excitement and it loses a lot of greatness. But to move a hole back like No. 5 or No. 11 that are designed to be the tougher holes out there and sandwiched in the middle of a round in between birdie holes, like 2 and 3, I don't think ‑‑ I think that's a good thing. So you want to make the hard holes harder, but you've got to be strategic on what holes those are. I think when you make an easy hole, like 7, one of the toughest pars on the golf course, it changes the entire dynamic of how the golf course plays. And Jordan Spieth with general thoughts on why excites him about the place. Q. I'm just curious, what is it about Augusta, Jordan, that appeals to you, that suits your eye and that allows you to elevate your game in such a way? JORDAN SPIETH: Well, I like the golf course specifically. I like the elevation changes, the sidehill lies, the pull to Rae's Creek, the way it affects putts. It's imaginative golf. It's feel golf and I really enjoy that; when I can go away from technicality and towards feel, it's an advantage for me personally, compared to how I play other places. I really love the tournament. It's pure golf. When we get to the driving range, it's just us. It's myself, my caddie, my coach. No offense; there's nobody else on the range, and that's actually kind of nice for a change to be able to feel like you're not pulled in any direction. You can just get out there and get done what you want to get done. And then obviously, just the feel, the crowds, leading into the tournament is second to none. I really like that and am able to feed off that. Rounds like today, just played the back nine, and just had a great time out there. It was just a lot of fun. You don't come away from a lot of Tuesdays saying that. It was just a neat experience in itself. In another I'll file under "how far pros have come" in the last five years, it was fun to see Stacy Lewis yearning for firmer, faster conditions and not just declaring today's players superior to their predecessors. I could do without her love of rough, but two out of three is still amazing. Three of the year’s first tournaments were won with 72-hole record scores. The average winning score this year is 20 under par. The LPGA’s last major, the Evian Championship, was won by In Gee Chun at 21 under, the lowest score by a man or woman in major championship history. “I definitely think play has gotten better, but I’ve also noticed over the last year and a half that our golf courses have gotten a lot softer,” Lewis said. “Softer golf courses mean you don’t have to think as much. You can be more aggressive and you can go at pins. There’s not as much penalty for a bad shot. I'll leave some of the proposed Rules of Golf changes to the wonks to dissect after they are unveiled, but from an architecture and course setup perspective, I'm fascinated by the change of approach to bunkers. • Relaxed restrictions on touching the sand with your hand or club when your ball is in a bunker: You are now prohibited only from touching the sand (1) with your hand or club to test the condition of the bunker or (2) with your club in the area right behind or in front of the ball, in making a practice swing or in making the backswing for your stroke. We all know this is a response to multiple video replay issues where the club could be seen touching the sand and the player was prosecuted for an inadvertent mistake. No one will miss those days. • New unplayable ball relief option: For two penalty strokes, you may take relief outside the bunker by dropping a ball back on a line from the hole through where your ball was at rest in the bunker. I haven't a clue what this unplayable option does to improve the game other than speed things up on a golf course with quicksand bunkers, so let's ignore that one. • Removal of special restrictions on moving loose impediments: There is no longer a penalty if you touch or move loose impediments in a bunker. "Play it as it lies" is a principle of importance since it was a bedrock of the original rules. Rules, Decisions and other changes in the game have dented the meaning of playing it as it lies in a sport that originally resonated because it was nature-based. 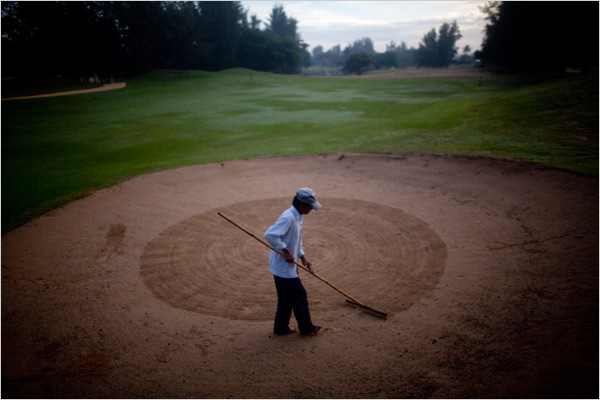 So will this new language make bunkers more or less hazardous and more or less maintained. I'm hoping more hazardous and less maintained. We all hate rocks in bunkers and what they do to a pretty new wedge. And perhaps with a loose impediment rule the governing bodies are actually applying reverse psychology here by saying to courses you don't need to spend so much time on making bunkers perfect, rock-free sanctuaries for recovery. Yet I can't help but think that given the freedom to fidget with the playing surface, modern players will continue to see bunkers as a sacred place where all golfers are entitled to a recovery and pristine lie at all times. Or, play it as I want it to lie. Cara Robinson and I summed up the Justin Rose/course setup comments on Morning Drive today if you want the quick version. We knew from 2012 post-mortems that Team USA lamented a 17th hole pin placement that favored Europe. So this time around the task force Task Force "Task Force" 2016 Ryder Cup winning-TASK FORCE set parameters (low rough, fast greens) and left the rest to the PGA of America's Kerry Haigh. While Hazeltine is strategically no Old Course, it was shocking Sunday to see almost no interesting hole locations. Nearly were all centered and whatever angles of importance there are at Hazeltine were rendered useless. Rees Jones' par-3 17th features a strange, clumsily-constructed green complex with almost no character, only a few intriguing hole locations and zero interest if it were not set by a lake. Yet, somehow Sunday, the hole location induced zero risk-reward element in flirting with the water. Setup-wise, this course can be as tough as you want it to be, there's no doubt about it. I think today, I think if we were all to be honest about it, I thought the setup was incredibly weak. I thought it was very much a Pro-Am feel in terms of the pin placements. They were all middle of the green. I don't quite understand that to be honest with you, world-class players, 12 world-class players here and 12 world-class players here in 30 minutes time, and we want to showcase our skills. We want to be tested. For example, the water holes out there, all the pins were as far away from the water as possible. I mean, the pin on 17 is an absolute, you know, a joke. It's a 9-iron into the middle of the green and you stiff it. So with a match on the line, you kind of feel like you want to have something -- you want a player to step up a little bit more than they have to. Even 18, if you hit a good drive down there, you've got a wedge into the green, and if you hit a wedge to the middle of the green, you're within 12-foot of the pin. So I just felt coming down the stretch, it was a little soft. Some saw this as sour grapes, but Rose seemed to be speaking as a veteran of match play who understands what kind of dynamics might be introduced when the course is a third element. Rory McIlroy is quoted by GolfDigest.com's Brian Wacker as lamenting the hole locations when combined with this week's low rough, but McIlroy also ultimately chalks up the situation to home field advantage. “Bad tee shots weren’t getting punished as much as maybe they should have been." Rickie Fowler, who beat Rose Sunday, defended the setup when asked. Q. In the European presser a few minutes ago, Justin Rose said that he -- he was very critical of the setup. He said it was weak and considered it to be similar to a Pro-Am. Your thoughts on that? Did you sense that from him? What were your thoughts on the setup? RICKIE FOWLER: The setup was, I don't think it was easy by any means. Him and I didn't play as well as we would have liked to. We didn't make many birdies on both sides. I felt like it was an even match between the two of us. Obviously, as you could see, no one was ever more than 1-up. It was easier for some; this guy next to me (turning to Phil) he made a few birdies. He's been playing well all week. I wouldn't say that the setup was easy, by any means. I thought that the PGA did well all week, Kerry Haigh and the staff. Depending on whether it be a foursomes or a fourball match and then into singles, they did a good job preparing the golf course, getting it in the right condition and with where the hole locations were. Obviously when it comes down to singles, it's fair. Everyone's playing the same ones. So I thought it was a good setup today and it worked out just fine for us. And there is the Ryder Cup course setup conundrum. Whether it's the Golf Gods, karma or just simple overanalysis, getting cute with setup can be unproductive. Try to do too much--the USA has tried the high-rough, narrow fairway approach too--it backfires. Erring on the side of too little means taking the setup role and some strategy out of the equation, which seems like a better way to go than trying to be clever. On the entertainment front, players were allowed to make a ton of birdies, exciting for fans and interesting to watch on TV. This is, after all, an exhibition. We were entertained. And unlike in a penal setup, players were winning holes through their play and rarely by the mistakes of their opponent. Easier and more shallow it may be, but also more rewarding to watch. Finally, and this is in no way to detract from the 63s that Sergio and Phil would have posted in their 19-birdie battle Sunday, but we got to see with a round of golf featuring a bunch of "pro-am" pins on immaculate greens, today's players can render a course harmless. It was a reminder of just how much tucked hole locations are used not to offset distance gains. 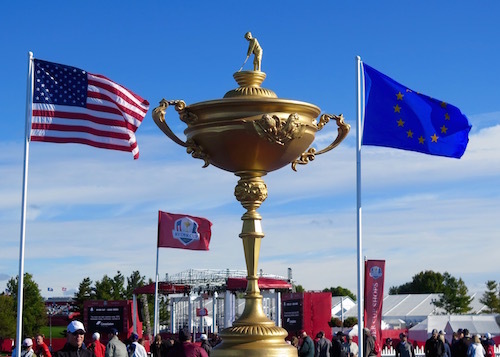 So the Ryder Cup proved entertaining because we got to see what today's players could do on a once-massively difficult course without facing pin placements designed to prevent birdies. There was a bit of something for everyone Friday at Baltusrol: great golf from Jimmy Walker and Robert Streb (the 30th 63 in a major, writes Brian Wacker), a rules issue with Jordan Spieth that generated much discussion, an epic course setup gaffe, and no shortage of volatile play from other top names. Adam Schupak on the leaders Walker and Streb. Best of all, we have what appears to be the makings of a grand finish with most of the game's best in the battle, assuming the Sunday weather will cooperate. Henrik Stenson is on fire, as he has been at other times in his career, Brian Wacker notes. After a 65 in the worst conditions Friday, Patrick Reed has positioned himself nicely in a major, for a change, reports Joel Beall. Alan Shipnuck goes a step further and says this is a potential breakthrough weekend for Reed. Ryan Herrington talks exclusively with Colt Knost about the wrong hole location and shares the PGA of America's explanation. “I called an official over and said, ‘What’s going on here?’” Knost detailed after his round. “And he said, ‘We messed up.’"
According to a release from the PGA of America, the Rules Committee realized the error after the players hit their second shots. Shortly after, officials handed out revised hole-location sheets to the group, and to all subsequent groups. Knost took to Twitter after the round. Dave Kindred on Jordan Spieth having a chance to salvage the season, especially with this being his last start of significance unless you consider the playoffs important. Kevin Casey at Golfweek.com with all of the particulars on Spieth's ruling and possible violation that was determined not to be a violation. Golfweek's Jeff Babineau says there was no rules issue. Nothing to see here, so move along. I think that was a little strong given what appeared to be a violation, but Babineau's explanation also does make sense given where we are with rulings. Once his ball was back on the path free of the casual water, Spieth took his stance, addressed the ball as if he were to play it, and got the thumbs up to play on from Gregory – ahem, the expert rules official. That’s all Spieth needed, though surely Mitch from Montauk and Sal from Summit soon were lighting up the phone lines once they saw one of Spieth’s spiffy Under Armour golf shoes hovering over a puddle. Spieth assessed his situation, facing 190 yards with some trees in front to negotiate, then elected to play in a slightly different direction than he originally planned – something he totally was within the rules to do. In fact, playing in a different direction is allowed under Rules of Golf Decision 20-2c/0.8. The 7th hole turned things around for Jason Day, writes Rex Hoggard at GolfChannel.com. Justin Tasch of the New York Daily News on Phil Mickelson’s triple bogey start plus other notes from a weird day that saw pre tournament favorite Dustin Johnson heading home early. Alex Myers with the evidence of Phil's rough start, which was salvaged by several birdies and a made cut for the Baltusrol defending champion. Rory McIlroy missed the cut and now, because he backed out of the Olympics has a lot of time off to rethink his putting issues, reports James Corrigan. Once again it was McIlroy’s putter to blame, although, bizarrely, it was the same implement which appeared to have dug him out of the hole on the 17th. There were three missed five footers and for the second day running – and, yes, for the umpteenth time this season - it was the shortest club in the bag which was letting down all the others. Brently Romine with the Ryder Cup ramifications of the current leaderboard. Round one ratings on TNT were down 30% from last year. Note to those missing the cut: Zika virus has come to Florida. Hope those guys skipping the Olympics over the virus are not spending much time in Florida for a while! And Then Henrik Said To Jordan: "Dumber than 18 at Chambers Bay as a par 4?" Out watching Scottish Open opening day play, an odd thing happened: players routinely putted out 3-4 footers. The overall pace seemed brisk, but relaxed. Case in point: the group of Fowler, Donaldson and Poulter were at the 17th green. Both Donaldson and Fowler hit mediocre first putts, leaving 3-4 footers for par. Both briefly marked their ball, repositioned for alignment, then putted out. This is hardly unique in the annals of golf, particularly on links. Except that such putting-out rarely happens any more due to professional event green speeds consistently in the Stimpmeter 12-foot range. The green speeds at Gullane for round one? According to the European Tour course setup "table": 10 feet, 3 inches. The "time par" for day one threesomes at Gullane was 4:20. That's about what it took the faster twosomes to get around Chambers Bay this year. According to the European Tour's charts of player pace for round one, groups played in the 4:28 to 4:48 pace, with the final two threesomes of the day taking a very respectable 4:48. And that's with a few long walks between greens and tees, along with enough breeze to make things interesting (and some rough too). The moral of the story? Green speeds impact pace of play, not to mention what they do for maintenance cost and architectural integrity. Yes, most of the top teams will advance to match play, but in recent years the NCAA's have suffered from questionable setups (Prairie Dunes bathed in rough for the men last year) and the women facing what sounds like an excessive test at Concession has many worried about what we'll see on TV.